I'll keep this brief due to the late hour. I'm normally a night person, but very tired after our 2 hour drive home tonight. In short we actually never made it to the balloon field. We made it to Indianola around 6PM and then waited 1 1/2 hours in a long line of cars. 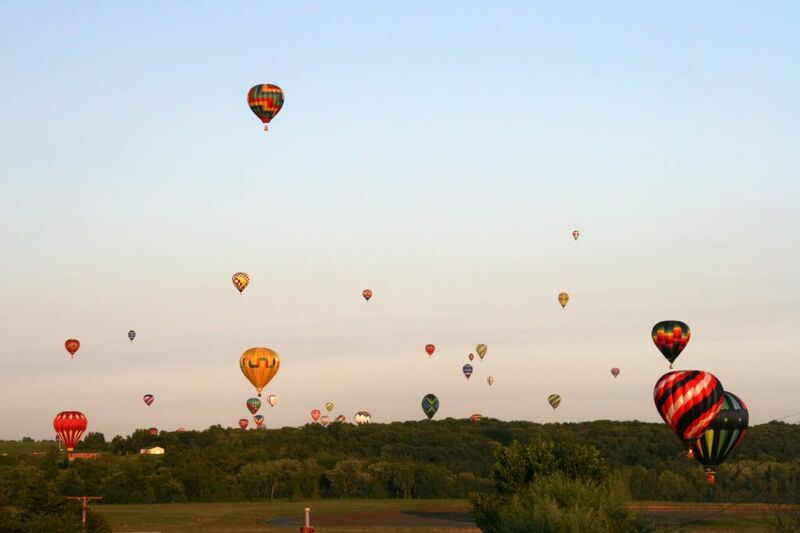 I grew up in Indianola and never saw that many people there for the balloon festival before. (That seemed to be the general consensus.) Definitely different than our last experience. Sorry Steph that we never connected. I did have an unexpected surprise though. I ran into another old friend. After Connor and I used the bathroom at the Caseys we were headed back to the car (on Hwy 92) and I heard my name. It was Piper who, ironically, was the car right in front of us that we had let in line almost an hour before. When they turned off we decided to stick with them because we knew we were never going to make it to the field in time (the ascension started at 6:30PM). We took some back roads and found some great views. It turned out different than expected, but it was great catching up with Piper and the kids were able to get up close and personal with one of their friend's balloons as it landed. Seeing all of those balloons in the sky is an experience everyone should have at least once in their lifetime. It's awesome! Neat! Glad you got to at least see them. I love that picture of the baby mouse, too, so cute (unless of course it does get into the house)! I love your picture!! Fun trip though! and great that you got to catch up with an old friend!! !